The Dr. Horacio E. Oduber Hospital (HOH) is the only hospital on Aruba. The official opening of the Dr. Horacio E. Oduber Hospital took place in January 1977. 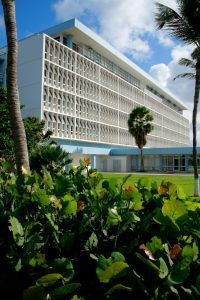 The hospital is named after the first Aruban doctor, Horacio E. Oduber MD. The Hospital has a capacity of 172 beds and offers all major medical specialism’s such as Pediatrics, Gynecology, Urology, Internal medicine, General Surgery, Neurosurgery, Neurology, Psychiatry, Pulmonology, Cardiology and much more. It has a Wound Care Clinic, a Dialysis Clinic, a stroke unit, Rheumatology clinic, an inpatient/outpatient Oncology department and a Rehabilitation Center. The hospital admits more than 10,000 patients per year and the Emergency Department attends more than 30,000 patients per year. When you visit the hospital please make sure you have a valid picture identification card with you. Before receiving services from the hospital you need to complete demographics and release forms. The deposit paid will be applied against the final bill. Overpayments will be refunded. If you were taken to the Hospital by ambulance, the ambulance fee of US$ 250 will be included in your bill. The Hospital collects this fee on behalf of the ambulance service. The laboratory is an independent organization and may send you a separate invoice. Some medical specialists working in the Hospital are not employed by the hospital. These independent specialists will provide you a separate bill. These invoices can be paid at the Hospital cashier. The patient is responsible for all costs incurred at the hospital and for completing the payments in a timely manner. Failure to comply with this results in extra collection and legal costs to the account of the patient. The HOH accepts coverage from the majority of insurance companies for the hospital stay, treatment and surgery with a valid letter of guarantee (GOP) from the insurance company. However, each guarantee letter is subject to acceptance by the hospital. The patient is responsible for informing the insurance company of the hospital admittance, completing the necessary forms and sending all necessary medical information in order to obtain a valid letter of guarantee. International patients are placed on the general ward. Depending on availability an international patient can upgrade to a semi-private or private room for which an additional room fee will be charged. At discharge all patients receive a copy of their medical records. Additional copies are available for a nominal fee. These must be requested by the patient him/herself. A copy of a valid picture ID must be sent with the request.